Since the Industrial Revolution, human activities have resulted into the eventual release of huge amounts of chemicals (organic/inorganic) into the tropical environment, either deliberately for agricultural and industrial purposes, or accidentally through the mishandling of chemicals. The release of heavy metals into the terrestrial ecosystem is a major problem. The tropical ecosystem is the largest in the world, and has a high population density. Soil acidity is a major problem in this ecosystem, and this soil acidity means that metals can be easily mobilized, causing a serious risk to the terrestrial environment. Heavy metals in soil pose a serious ecological risk as these metals cannot be degraded or permanently removed from the land. 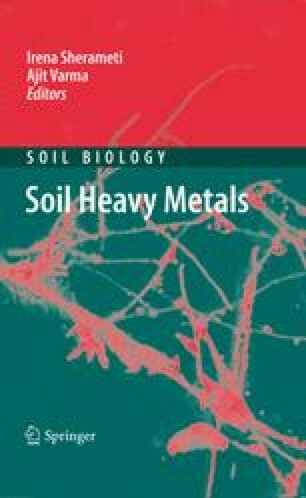 The development of methods for the in situ remediation of heavy metal contaminated soils is needed to make such soils acceptable for agriculture. In this chapter, various methods of remediating heavy metal contaminated land are described. It is known that microorganisms are present in almost every environment on Earth and that they are capable of degrading and minimizing a broad range of toxic chemicals. In general, in situ bioremediation and/or phytoremediation are suitable methods for reclaiming heavy metal contaminated sites. However, the numerous classes and types of these chemicals apart from the soil structure complicate the removal of many toxic metals from the environment. As an alternative, an ecological approach has been developed involving the use of plants to clean up or remediate soils contaminated with toxic metals. A group of plants termed “hyperaccumulators” are considered to be the best candidates for taking up toxic metals, transporting them, and accumulating them. Biotechnological applications, especially transgenic plants, probably hold the most promise for augmenting agricultural production. However, the application of these technologies to the agriculture of tropical regions containing the largest areas of low productivity, where they are most needed, remains a major challenge. Some of the most important issues that need to be considered to ensure that plant biotechnology is effectively transferred to the developing world are discussed. The authors are thankful to their B.Tech (Biotech) 2008 students, Vijyendra, Gaurav, Preetika, Raman, Prachy, Aparna, Anant, and Harsh, for providing updates on knowledge and research in this field. We are also thankful to Major General K.K. Ohri (AVSM, Retd. ), Mr. Aseem Chauhan (C-VI), and Prof. Suprabhat Ray, Director, Research, for encouraging us and for their discussions on this subject.